10 September 2018 // In regards to the Convention of the Rights of Persons with Disabilities (CRPD) monitoring on Bulgaria, the Association for Spina Bifida and Hydrocephalus of Bulgaria (SBHB) has prepared an alternative submission for the second year. On the 3rd of September Slaveya Kostadinova, president of SBHB, has participated in a dialogue with the Committee members. Slaveya presented the most serious difficulties that Bulgarian children living with spina bifida and hydrocephalus meet in their life. To present the situation, Slaveya used the example of Emiliyana Stankova, a 15-years-old child with spina bifida and hydrocephalus. In order to give their daughter a normal life, Emi’s family pays for almost everything that she needs – wheelchair, splints, catheters, therapy. Thousands of Bulgarian families which have children with disabilities face the same situation. Both SBHB and IF expect the Commission to give advices to the government in order to improve the care for children with disabilities and provide them with access to a good quality mobility equipment, health care and assistance care. 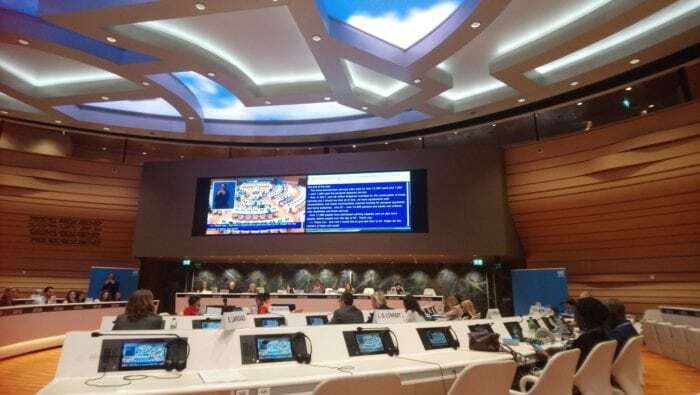 Slaveya had private meetings with the committee members, OHCHR Disability Advisor Mr. Facundo Chavez and Ms. Catalina Devandas, who is Special Rapporteur on the Rights of Persons with Disabilities.